Tattooing is the most misunderstood art form in Japan today. Looked down upon for centuries and rarely discussed in social circles, people with tattoos are outcasts in this country, banned from most public spaces such as beaches, bathhouses, and even gyms. Tattoos have an extensive history in Japan, and to truly understand the stigma behind them it is essential to be aware of their significance. The first records of tattoos were found in 5000 B.C., during the Jomon period, on clay figurines depicting designs on the face and body. The first written record of tattoos in Japan was from 300 A.D., found in the text History of the Chinese Dynasties. In this text, Japanese men would tattoo their faces and decorate their bodies with tattoos which became a normal part of their society; however, a shift began in the Kofun period between 300 and 600 A.D where tattoos took on a more negative light. In this period criminals began to be marked with tattoos, similar to the Roman Empire where slaves were marked with descriptive phrases of the crime they had committed. This stigma towards body modification only worsened: by the 8th century Japanese rulers had adopted many of the Chinese attitudes and cultures. As tattoos fell into decline, the first record of them being used explicitly as a punishment was 720 A.D., where criminals were tattooed on the forehead so people could see that they had committed a crime. These markings were reserved for only the most serious crimes. People bearing tattoos were ostracized from their families and were rejected by society as a whole. Whereafter tattoos experienced somewhat of popularization in the Edo period through the Chinese novel Suikoden, which depicted heroic scenes with bodies decorated with tattoos. This novel became so popular, people began to get these tattoos as physical rendering in the form of paintings. This practice eventually evolved into what we know today as irezumi or Japanese tattooing. This practice would have a monumental impact, with many woodblock artists converting their woodblock printing tools to begin creating art on the skin. Tattoos became a status symbol during this time; it is said that wealthy merchants were prohibited from wearing and displaying their wealth through jewelry, so instead they decorated their entire bodies with tattoos to show their riches. By the end of the 17th century, penal tattooing had largely been replaced with other forms of punishment. The reason why tattooing was once again associated with gangs, however, was that criminals were able to cover up these penal tattoos with larger more elaborate decorative tattoos. 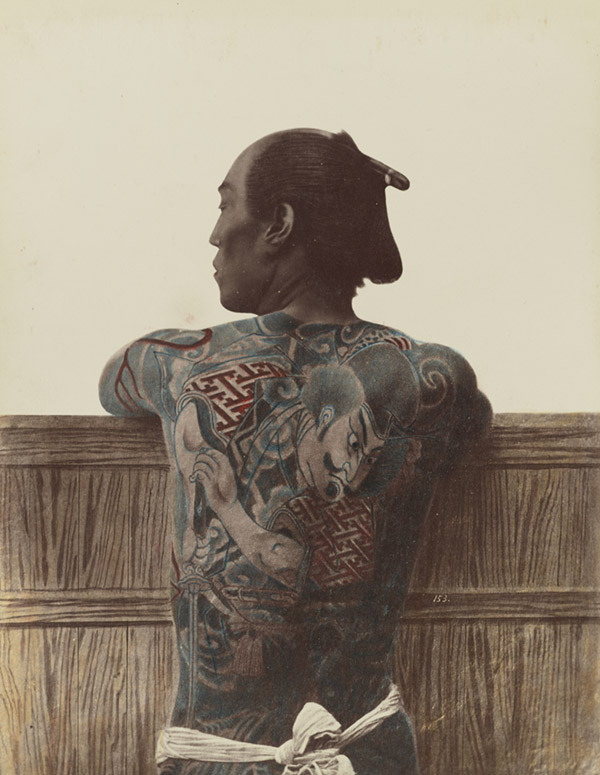 The Yakuza began using tattoos as a pledge of sorts to show their commitment to the gang; however, once again tattoos became outlawed in 1868. In the Meiji period, the emperor, once again banned tattoos as he thought them distasteful and barbaric and to westernize the country. Interestingly enough, this law did not apply to tattooing foreigners. Thus many tattoo artists set up shop in Yokohama and began tattooing sailors, which attracted some distinguished clients from Europe. In 1936 war broke out between Japan and China again, and people with tattoos were considered to be problematic and undisciplined. As such, tattooing was completely banned until 1946. In today’s world tattooing has once again become popular. They have become a fashion symbol and a symbol of toughness. But somewhere, deep-rooted in the Japanese psyche, there still remains a stigma towards people with tattoos. Personally, after examining Japan’s roller-coaster history of tattoos, I can’t say if this recent popularity may simply be a phase; however, whether or not it is still a trend in the next century or not, the intricacies and dedication put into each irezumi piece will forever be an admirable aspect of body art unique to Japan.